Gluten-Free Dark Chocolate Walnut Bliss Bars. Sorry, just had to say that again in case you weren’t paying attention. Are you with me now? I know I needed an afternoon wake-up myself. 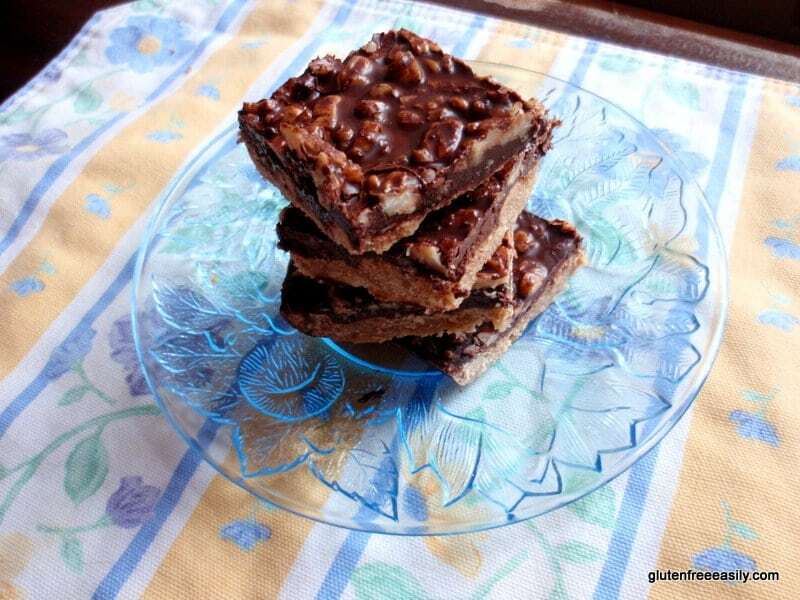 These Dark Chocolate Walnut Bliss Bars will help with that! On the back of the bag of Diamond brand walnuts is a recipe for Walnut Toffee Bars. I’ve thought about adapting that recipe to gluten free for quite some time. When Linda (Gluten-Free Homemaker) shared her challenge for this month, Create a Dessert Bar, I thought of that recipe again. Then I thought of several other possible bar options. Fruit Pizza Bars using this recipe from Heather as my starting point. Orange Olive Oil bars using this recipe from Zoe perhaps. Chess Bars or Lemon Chess Bars, both old gluten-full recipes that I have yet to make gluten free, and ones I’d want to make dairy free as well. I think there were a few more possibilities, too. Yep, that’s how my mind works some days. But this morning, I came back to these bars. Yes, this morning before work, I had to make these bars. I wanted to have the recipe finished so I could include them in Linda’s weekly roundup, Gluten-Free Wednesdays. Baking before work in the morning can actually be a breeze when one is using a favorite, well-loved recipe. You know one for which you already have the ingredients memorized. My Flourless Peanut Butter Cookies are a good example. I can make those and have them out of the oven in 15 minutes. They cool for 10 more minutes while I’m in the shower and I’m good to go. If I want to make them ultra special for a work luncheon or to give a tin full to a friend, I grab a jar of Nutella (or perhaps homemade Chocolate Hazelnut Spread one day) on the way out the door. I can spread the heavenly filling between the cookies in just a few minutes on a break. This morning I wanted to create a gluten-free, dairy-free, refined sugar-free walnut toffee bar using Diamond’s recipe as my inspiration. I needed a crust. I wanted to make it a bit healthier so I used a combination of my usual gluten-free flour mix and coconut flour. Then I added in coconut oil, coconut sugar, an egg, vanilla extract, and sea salt. After I baked the crust, I melted some unsweetened Scharffenberger dark chocolate (99% cacao) with coconut oil using a double boiler. When all was melted, I added a small amount of coconut sugar and an even smaller amount of our bees’ honey. Then I mixed in more chopped walnuts. I poured this mixture over the crust. Now here’s where the “before work” factor comes into play. If I’d had plenty of time, I might have just let the chocolate walnut topping set up on its own, although I’m not sure that would have happened with this recipe. Fortunately, I didn’t have time, so I popped the bars in the freezer (while I took the dog outside, fed the cat, fed the fish, put a load of clothes in the dryer … you get the picture). About 20 minutes later, I grabbed the pan from the freezer and headed to work. The resulting cold dark chocolate walnut toffee-style bars are blissful; there’s no doubt about it. Now you should know that these bars are not very sweet. To me, they don’t need to be. Nothing messes up good dark chocolate more than too much sweetness. I loved these bars and so did most of my co-workers, but one friend of mine confessed that she wished for more of the emphasis on sweet versus bittersweet. If your usual favorite chocolate treats are milk chocolate based, you might want more sweetener in this recipe. So be sure to taste your chocolate mixture to see if you want to add additional sweetener before pouring it over your bottom layer. If you would like the mixture—and your gluten-free Dark Chocolate Walnut Bliss Bars, of course—to be sweeter, I recommend adding more coconut sugar versus adding more honey (the coconut sugar will dissolve and not add that much additional liquid like the honey will). Note that these bars will need to be kept in the refrigerator or otherwise the chocolate topping will melt. Trust me … it won’t be an issue as they are so incredibly good cold. There will be a little bit of chocolate melting action on your hands when you eat them. You can either lick your fingers (gasp!) or file your complaints in that rectangular file “cabinet” in the corner of my kitchen. Hehe. But please leave your positive feedback in comments below. Follow your bliss with these Gluten-Free Dark Chocolate Walnut Bliss Bars! These Dark Chocolate Walnut Bliss Bars are not only gluten free but also dairy free and refined sugar free. Oh, and they are good. So, so good! Preheat oven to 350F degrees. Grease 8 x 8 baking pan. For bottom layer/crust, in medium-sized bowl, mix coconut oil, coconut sugar, egg, and vanilla extract. Add in gluten-free flour mix*, coconut flour, and sea salt. Mix until mixture forms a ball. 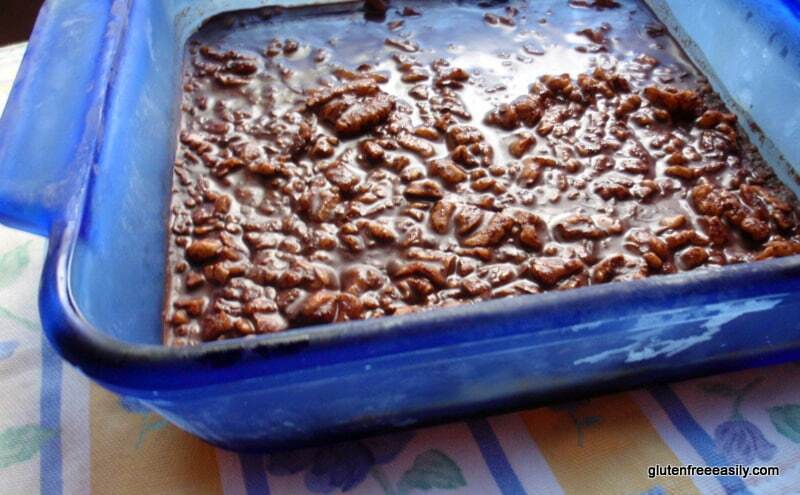 Mix in walnuts. Spread into pan using a silicone spatula. Bake for about 20 minutes. Bottom layer/crust should be golden brown when done. Towards the end of the baking time for the bottom layer, start preparing chocolate mixture that will be your top layer. Melt chocolate and coconut oil in pan using double boiler method. Stir continually to ensure chocolate doesn’t burn. Remove from heat when all chocolate is melted. Stir in coconut sugar, honey, and walnuts. Taste. If overly bitter to you, add slightly more coconut sugar and stir well. Remove pan from oven. Let sit for a moment if you are still preparing chocolate mixture for top layer. Pour chocolate mixture over bottom crust. Place pan in freezer uncovered for about 20 minutes. Cut into squares with sharp knife or metal spatula. Serve immediately. Return remaining bars to the refrigerator after serving. Instead of unsweetened chocolate, coconut oil, coconut sugar, and honey for the chocolate mixture/top layer, you may use one cup of gluten-free, dairy-free semi-sweet or dark chocolate chips. Just be sure to get ones that are also refined sugar free, if you need that requirement. Follow directions as shown from that point on. If bars have been in the refrigerator, let warm to room temperature a bit before serving so they will soften some. No broken teeth, please. Originally published April 13, 2011; updated July 17, 2018. Shirley, I can just taste these! Hey Debbie–Thanks! That’s quite a compliment. I do love these and so does Mr. GFE. 😉 Hope you will to if you try them! You had me at dark chocolate! I love my chocolate cold, so this is really calling my name! Maybe I’ll make them this weekend! Hi Ricki–Thanks! I probably don’t get to work as early as you do and I get up early with Mr. GFE, so I literally have a few hours in the morning. It would be better if I’d get to work earlier, but I haven’t figured out how to do that yet. LOL Well, after our extensive Twitter conversation this evening, now you know that I wrote the wrong info in the post because I was looking at the wrong package of ScharffenBergen, not the one I actually used. The unsweetened chocolate I used was 99% cacao, just cacao beans and vanilla extract for this ScharffenBerger chocolate. 🙂 So all is good! Thanks for keeping straight! Enjoy, dear, if you make a version of these. This looks delicious! I love making bar treats. They are just so much easier than cookies. My boys would flip over these! Oh these look super yummy, Shirley! These sound so delightful. Yum! I bet pecan would be good in this recipe, too. I love walnuts for snacking but somehow not as much in baked goods. Glad to see you share this in Kelly’s event! Hi Sea–I’m a huge pecan lover myself. Two things kept me from using pecans in this recipe … first, my inspiration was a walnut-besed recipe, and second, I was out of pecans! Usually I keep a bag in my car and in my lunch bag. I keep walnuts, too, but the pecans always disappear faster than the walnuts. 😉 I don’t necessarily like walnuts in traditonal baked goods, but there’s something about the chocolate and the coldness of these bars making the walnuts work so well. I can’t explain it really. I’m amazed that you are able to come up with something that looks like that and can almost pass as ‘good for you’ (at least in my book!). I wake up every morning around 5:30 am, sneak downstairs like a criminal so as to avoid waking up the house, and bake and recipe test. I actually find it makes the day go more smoothly. Go figure! Oh, you’re a kindred spirit! I do like baking in the morning, especially when it’s cold weather and the oven helps warm the house. 🙂 We get up at 5:20 am (and were getting up at 5:00 am for several weeks when Mr. GFE had to be at work earlier) and hubby is gone in about 30 minutes, so then I’m home alone baking and doing tons of other stuff. I agree; I think it all can set the tone for the day! Oh Shirley, I’m gonna have to back away slowly out of your blog, before these things haunt me. Okay, too late. Wow they look good. Holy smokes!! I need to make this, like, yesterday! Because then they’d be in my belleh right now! Hi Maggie–Don’t you think it’s true? Foodies just place importance on different actions. 😉 If I had some hazelnuts, I’d make the homemade chocolate hazelnut butter in a heartbeat! That Justin’s Chocolate Hazelnut Butter is awfully good though, and tons better than Nutella. Looking forward to hearing what you think, dear! I’m not completely refined sugar free, but getting there quickly. Sugar-sweetened items are tasting way too sweet these days! BTW, used your date trick in a smoothie the other day. My blender likes me a whole lot better now that I’m following your “soak in boiling water” method. 😉 I was about killing it before! Hi Sophie–All of your comments make me want to reach through the screen and hug you!!! Seriously. 🙂 These Bliss Bars earn their name, so all the MMMMMs are appropriate. 😉 Thanks so much, my dear! Oooh, I’ll definitly be following this bliss! Wow! You get a lot done in the morning, Shirley. These bars look delicious. I’m glad my challenge helped spur you on so you could share this with us. Oh my heavens Shirley! These look and sound amazing. Time to restock my coconut oil!! Hi Alisa–Yes, get some coconut oil! Although I’m sure you could make them with melted non-dairy “butter,” too, but I like them with coconut oil. 🙂 Hope you make them and report back! LOL, Aubree! I have to admit blissful (or bliss-inducing?) and droolworthy are both very appropriate adjectives for these bars. 🙂 I’m making them again for Easter so I can wow everyone else, get a bar (or two! ), but not have a whole pan for Mr. GFE and myself. 😉 Yippee, that I made your Favorite Recipes post—thank you!! Hi Sonia–Thanks so much! I was a little sad I didn’t have time to make some more of these for my Easter celebration yesterday. But then I realized that when I do make them, there’ll be more for Mr. GFE and me. 😉 LOL, but true for the most part. Might have to share a little. I came across this recipe just lately, I was looking for a low carb snack bar and this sounded so good. I tried it but I substituted almond flour/meal and added a layer of sugar-free coconut and almonds (could use walnuts)and it is VERY good. I used Splenda for the sweetener and was quite surprised with the result. I also added a few shavings of paraffin wax and they set up nicely. I love them and will make them again. Hi Tina–A very belated welcome to gfe! 🙂 I am very, very happy that this recipe worked for you. I love that you used almond flour for the base. I’ll be making that version next time. I can’t get enough high quality nuts. I’m not a fan of Splenda, so I’ll stick with coconut sugar. Thanks so much for taking the time to comment and share your review and changes, Tina! I think the name says it all! Wonderful recipe Shirley! Hi Vicky–Yes, the name for this recipe is very apt! 😉 Once one tries them, one is hooked. 🙂 Thanks, dear! Happy weekend! How have I missed these luscious little morsels SHirley? Thanks for sharing them on Allergy Free Wednesday, I am featuring these this week…and making them too! Yep, they’re delicious!! I used palm shortening, as my kiddos can detect coconut oil sometimes, and I had to increase the palm sugar and add stevia to the topping to make it work for our tastebuds, but they are delicious! Oh and we used almond and coconut flours for the crust to keep it paleo! Yay!! Thanks so much for sharing your adaptation! It makes sense that you had to add more sweetener after subbing palm shortening as it adds no sweetness and I feel the coconut oil does add a bit of its own sweetness. Please tell me how much almond flour and coconut flour you used. I’d love to make these grain free next time and I’d like to add a note in the recipe to give readers that option (stating that the grain-free option is your tip, of course). I love the idea of whipping these gorgeous bars up before leaving the house in the morning, Shirley! They sound absolutely amazing and I can’t wait to give them a try. Thank you for sharing your Dark Chocolate Walnut Bliss Bars with us at the Hearth and Soul Hop. I can definitely understand why you call these bliss bars, Shirley! Oh my, they sound so good! I was interested to read what you said about sweetness and dark chocolate – I totally agree. Thank you so much for sharing these delicious treats at the Hearth and Soul Link Party. Have a wonderful weekend! Thanks on all, April! I definitely need to make these treats again soon. We all need some bliss in our lives, right? Hope you have a wonderful weekend as well!